Animated: No; Low-poly: No; Materials: No; Rigged: No; Textured: No; UV Layout: No; 3D File Formats Included: .obj (multi format); Created In: zbrush 4r7; Geometry: Polygons; Poly Count: 3117938. 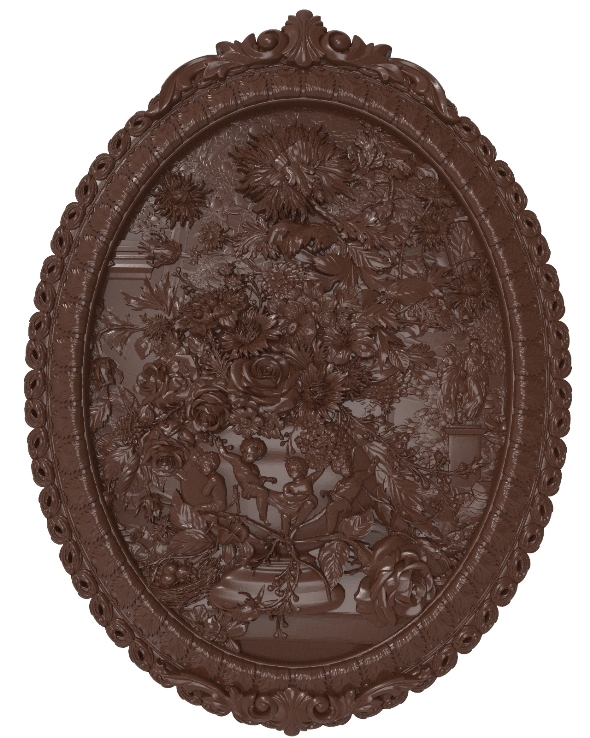 Bas relief of the painting "Flowers composition" is a digital high polygon 3D model (STL and OBJ formats). This 3D model is prepared to physical production by 3D printing, CNC machining, also for making a mold for casting in gypsum, plastic, metal, chocolate, etc. Also it can be used for interiour design and vizualizations. The original size of digital bas relief is 300X400x16 mm. 3D model can be scaled up or down. If you need more bas reliefs, click to Ў®moshchan' link on the right to see my other products. Lighthouse and sailboat bas relief for CNC; Sailer (ship) bas relief for CNC; Flowers composition in the frame bas relief for CNC; Deers on lawn Bas relief for CNC; Lions at rest Bas relief for CNC; Chinese dragon bas relief for CNC; Carnation bas relief for CNC. Keywords: 3d, 3d-print, aster, bas, blossom, carnation, carving, chamomile, chrysanthemum, cnc, cupid, flower, high-poly, leaf, leaves, mold, obj, plants, printable, printing, relief, rose, sculpture, stl, zbrush. Best stock graphics, design templates, vectors, PhotoShop templates, textures & 3D models from creative professional designers. Create 3DOcean Flowers composition bas relief for CNC 21002434 style with PhotoShop, Illustrator, InDesign, 3DS Max, Maya or Cinema 4D. Full details of 3DOcean Flowers composition bas relief for CNC 21002434 for digital design and education. 3DOcean Flowers composition bas relief for CNC 21002434 desigen style information or anything related.